A rather dramatic title to this blog, and perhaps slightly unfair too. But this and the following three blogs are my story of a visit I made to Papua New Guinea in August 2014 to climb Mount Giluwe. Papua New Guinea forms the eastern part of the island of New Guinea which lies to the north of Australia. The western part of the island forms a part of Indonesia. The island sits on the Australian tectonic plate and so forms a part of what is known as Australasia with Australia and most of New Zealand as well. It is also on the Pacific Ring of Fire, so has a share of volcanoes. Papua New Guinea became independent in 1975 having been administered from and by Australia for 60 years and before that by German and British administrations. The country is part of the Commonwealth with the Queen as head of state. It is said to be one of the least explored parts of the world, is the most mountainous country in the world but is also one of the most culturally diverse. Because of lack of communications (most of the country is covered by impenetrable rainforest) society developed into a huge number of tribal communities with over 800 languages. Often, interaction between tribes comprises solely of violent disputes of land boundaries. 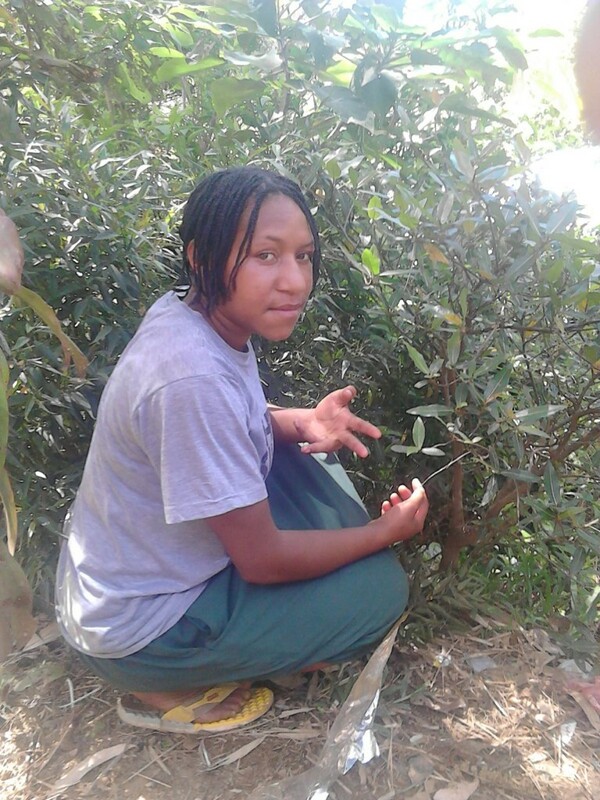 In the past the consequence of being captured or killed was that you found yourself in the pot. Yes, cannibalism was rife! So the country has gained a certain reputation. Whilst it is probably true to say that the headhunting culture has largely disappeared, violence does still erupt from time to time whether this be the night time robberies in the capital of Port Moresby or the blocking of roads and demands for tolls (or your possessions) that can occur anywhere. So it was with a degree of trepidation that I decided to organise a trip there. Unsurprisingly there are no UK operators that do this. More surprisingly there are not that many Australian ones that do. Those that do, organise trips to the tourist hotspots in parts of the country that I was not looking to visit. I did find one company, but the mark-up they wanted for their services was not that which I was prepared to pay. As a result I ended up making arrangements with a local operator myself. Why Papua New Guinea and why August 2014? Well to deal with the latter part of the question first, I was then going to be on a family holiday in Australia then so at least Papua New Guinea was relatively close. As for the first part, well isn’t that obvious? I do tend to write about my hill and mountain going experiences – so there was a volcano there that I wanted to climb and that was Mount Giluwe, the highest volcano in Australasia/Oceania! More of that anon. I have been intending to write something about this trip for a while. But in this first instalment I am not going to focus on mountains. In Papua New Guinea I had one of the most intense, albeit short, and wonderful experiences of my life. Let me introduce you to Grace. Grace sent me this picture by WhatsApp a few days back. Grace is 16 and when I met her was shy to start with. Actually, her English was quite good – particularly as I was about only the third white face she had ever met. But she opened up a little in the time I was with her and her confidence grew. So she is a teenager with a mobile phone and access to modern apps. Well yes, but she is also the daughter of a subsistence farmer who supplements his income by guiding people up his local mountain. Like about 80% of the population of Papua New Guinea, Grace, her father (Gedion), her mother (Lilly), her three brothers (Yarex, Rendy and Roro) and her aunt (Racheal) all of whom I met, live in a small community of subsistence farmers. Here is the happy family. Their staple food is the sweet potato. In Papua New Guinea the sweet potato comes in various colours – orange, yellow, red, white and beige. In the fields behind the village, potatoes grow in large earth mounds. When the family can afford it they will buy a chicken. Alternatively the village will organise a hunt in the forest where tree kangaroos, cuscus (a marsupial) and birds can be found. This seems to be the only source of protein in the diet. The family live in a hut in a clearing. There are two other huts there. A narrow and often muddy track leads down to a motorable track (I hesitate to call it a road) on the other side of which is the remainder of the village. The village is called Mailka. The nearest larger habitation is Tabul where there is a secondary school. In the village beyond the immediate cultivated land but before the forest, grasses are encouraged. The grass is used for bedding, covering roofs and for weaving (including a curtain that could be drawn across the entrance). Hidden in the corner of the nearest field is a toilet within a small wooden structure – a facility I did not visit. The hut itself has four walls, a roof and earthen floor and a small entrance. Near the centre of the floor there is a fire where sweet potatoes slowly bake on a metal tray. The atmosphere inside is throat chokingly smoky. On the left as you enter, against one of the longer sides of the hut, there are four bunk beds which the family share. Husband and wife have one with their baby boy. The two lads have one. Grace has her own – for the moment. I perch on the edge of one of the beds as there is no other furniture. I had the opportunity to share some time with the family whilst waiting for my transport back to the Lodge at which I was based. Racheal’s English was pretty good. Gedion’s was patchy. He even admitted to me at one point that because I was talking too fast for him to understand me that he just nodded at me in agreement! After then I was careful to slow down the pace of my speech. Although the family’s life is relatively spartan, there is a primary school which is a 40 minute walk away. It took almost as long to drive such is the state of the track to their village. The secondary school in Tabul is a bit further away. In the couple of hours I spent with them, we swapped stories of our lifestyles. I am not sure that they understood everything I said even allowing for the language barrier. My audience was inquisitive. They had heard of Australia and knew roughly where it was. They had heard of Russia as they had recently had some custom from there. And England. But they had no idea where in the world it was (or Russia). I scratched an outline of the globe on their floor and tried to show them where I had come from. But they had no idea of scale. I got my camera out and showed them photos on the small screen on the back of the camera. The kids crowded around me as I showed them first family pictures, then pictures of Jet. They liked Jet. Grace was fascinated with my photos of Kirsty who is just a couple of years older than her. I next showed them photos of my trip so far to Australia. This included some of the animals I had seen. This one in particular caused some amusement. They thought that this was a picture of me showing off a kill I had made! 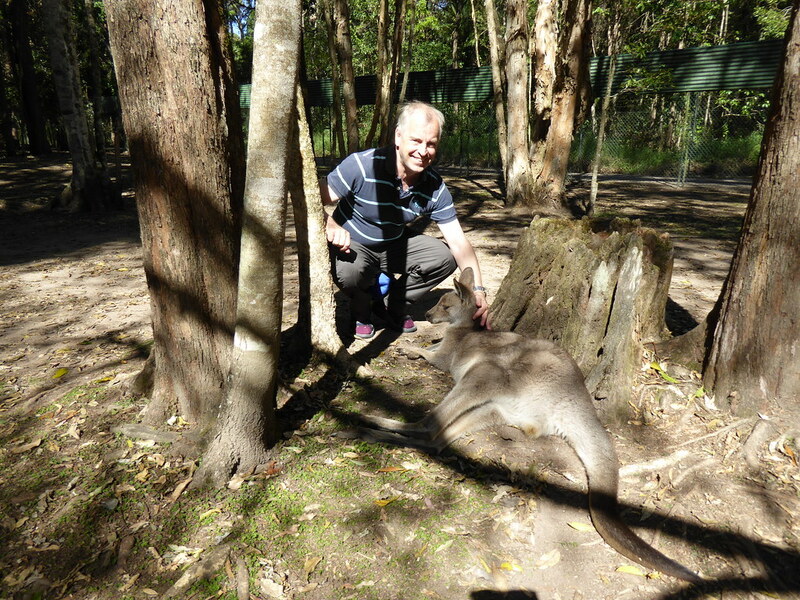 I imagine that this kangaroo could have fed the family for a couple of days. It was tempting to confirm the presumption they had made, but the idea of zoos/wildlife parks caused them some bemusement. I heard more about their school and church. A feature of the country is the large number of churches of many denominations – no doubt a consequence of missionary activity. The churches run a lot of the educational facilities in the country. I was offered and accepted one of their baked sweet potatoes. Eventually it was then time for me to leave. The whole family came to see me off. It was a fascinating experience to start to get to know Gedion’s family. A wonderful couple of hours. I think that the drinks are on Mrs Thomson. Part 4 of this blog can be found here. We are up for an 8am breakfast then it is time to pack those final items. The mules will carry our large bags down to camp 1 so we just have our day sacks. Mehti wants to take a picture of the group in front of the shelter. This is done once our bags are piled up for the muleteers to collect. This they will do after we have left. It is a lovely day – no sign of any bad weather. Mehti produces a banner advertising Kassa Tours for us to hold in the photos . All fine until we notice that it is the wrong one and is advertising Pik Lenin rather than Damavand. Still he stands so far back from the group to take the photos that I doubt of the wording on the banner will be visible anyway. We make our way through the camp and on to the dusty trail down. There are lots of people on it, mainly coming up. Given some of the clothing being worn, I hope that many are just going to camp 2 for the day. 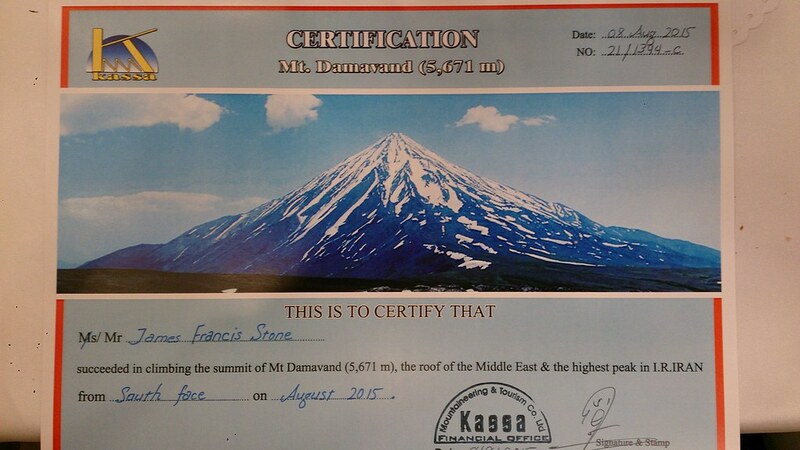 But Damavand is a popular peak so who knows. We stop once for drinks before continuing our downward track. At one point we come across a muleteer ascending whose mules decide to scatter across the hillside. This results in much laughter – poor chap. It takes him a while to gather them back together. At another spot, on a rocky knoll, a group is engaged in dancing. We decline their invitation to join in. Soon we see the golden glistening of the mosque. Looking back up, the conditions at the summit seem to be more ominous. And we are down. Our transport is not yet there. We will spend the night at the Polour shelter (base camp) as we are a day early coming down. We shelter under a large canvas awning and have tea. It is hot again. We also wait for our bags, but there is no sign of the mules. Eventually it is decided that we will leave anyway. The bags will catch us up. So we pile into the 4WDs that have now arrived. First we return to the restaurant in Polour that we visited on the way in. The food is as good as before. This time there is barbecued fish in addition to the lamb and chicken. The fish is reared locally. The cooler water from snow melt hereabouts enhances the taste, apparently. Next we go to the shelter. There is no sign yet of our bags. We are allocated a room with three sets of bunks, and plugs to recharge phones! Despite a promise of some, there is no wi-fi to report success home. We generally laze about. I am feeling good, no sign of tiredness or fatigue. Mehti produces some water melon that I am happy to eat – it all helps with rehydration. After whiling away a couple of hours it is dinner time. There are snowflakes in the air. Although the summit is not covered, it looks very dismal on Damavand. If you cannot see the steam from the fumaroles up there, you know it is windy. We cannot see steam. It also looks a little whiter up there. Whatever. We have our summit and it does not really matter what the conditions are like. Eventually, after dark, the bags arrive. The next morning our transport to Tehran arrives. It is the same modern people carrier we had to bring us to Polour. We squeeze in after our bags and are off. Majid has his own car there so we say goodbye to him. Mehti stays with us. The windows are open in the vehicle to keep us cool and curtains are pulled back to enable us to watch the countryside pass by. We stop once for Mehti to buy some soft drinks. A couple of hours later we are back in Tehran at the hotel. Whilst we have been away the road in front of it has been torn up! So we are dropped at the end of the road and lug our heavy bags to the reception. I share rooms again with Yde. We depart at separate times in the morning. Yde will be disturbed because I (and Neil) will leave at 4.30am. Yde is staying on another day for sightseeing. Arrvind has another week and is going south to Esfahan and Shiraz. Stu, Rob and Phil have flights later in the day. En route to the hotel we discuss what to do with the remainder of the day and agree to hire a vehicle and guide to do some quick sightseeing of our own. We leave the hotel again at 2pm. First Rob and I insist on visiting a sportswear shop so we can buy authentic Iranian national football kits (don’t ask). Once that is done we visit two sites. The first is the Azadi Tower located at the old western entrance to the city. It is surrounded by some nice greenery and by a busy road that we risk our lives crossing. There is a museum under it but it is closed this day. Then we go on to the Milad Tower, distant pictures of which are in my first Iran blog. This is the 6th highest tower in the world and sits atop a ubiquitous shopping centre and a convention centre. In fact we arrive just before a group of visiting Korean dignitaries sweep in with their black limos and motorcycle outriders. A trip up to the viewing floor is a must. So we part with some rials and take the lift up. Smog can spoil the views. Today it is not too bad and we have views all round. And there is one to the north that shows Mount Tochal. In the evening we have a celebratory meal. Unfortunately Neil is still under the weather. The food is indifferent, but OK. The water is good though! We are joined not only by Mehti but also by Ahmad, one of the owners of Kassa Tours (the in-country agents who have done very well for us). Ahmad dishes out certificates. My thoughts on Iran? It was an interesting place to visit. The people we met were invariably friendly and, often, curious. The educated classes tend to speak English, though it seemed to be the case that other nationalities were looking to exploit the easing of tensions more so than the British. The food is interesting. The traffic is manic. The place is a lot better served infrastructure-wise than I had expected. Tehran is only worth a short visit. Arrvind had the right idea, I think, to spend more time exploring the cultural aspects of the country. That is what I would do if, as I hope may be the case, I visit the country again. It is also a bureaucratic place, exemplified by the fact that Neil and I had to queue for an hour at the airport to show our passports just to get out of the country. Perhaps with the signing of the nuclear deal things will improve for those with British (and American, Canadian and Australian) passports. But the political situation moves fast. What with Syria/Iraq and the potential face-off between the Saudis and Iran once sanctions are relieved, perhaps things will become trickier. So now may be the time to visit. I hope you have enjoyed reading these blogs. Part 3 of this blog can be found here. On Wednesday, 5th August 2015 I wake up on a concrete floor in converted stables. Sleep has been OK, if broken. My ageing body is not used to sleeping on a thin blow up mattress. It was warm enough to sleep just in a sleeping bag liner, though someone has opened a window during the night. I celebrate by changing my underpants for the first time since going to Tochal! As I stir I feel a lump in the softshell top I had been using as my pillow. A familiar pattern shows itself creeping out of one of the sleeves. Although I am more awake than asleep, it takes a moment or two to register and for my brain to compute. Joy! It’s my buff. My curiosity as to how it got there is overtaken by the relief of having found it. It’s surprising how small things can change the mood for the day, though I do not disclose to my team mates my discovery. I wonder if they detect any change in me?! Breakfast is served. As this is largely fried eggs, I make do with cake and a couple of bananas. Today we will ascend around 1,200m (4,000ft) to camp 2, known as Bargah Sevom. Unfortunately Neil decides he will not be coming with us. He has been suffering from intestinal and fitness issues. So a taxi back to Tehran is organised for him. He will wait for us back at the Ferdowsi International Grand Hotel. It is, as forecast, a beautiful day as the bags and food are loaded on to the mules. We will just carry day sacks. One advantage of the Ferdowsi was the availability of the internet. Many sites, such as BBC News, Facebook and other social media channels, are blocked in Iran. However, our trusty mountainforecast.com was not. This was a service we had used in South America last year and their forecasting did not seem to be too bad. So before leaving the hotel I had obtained the most up to date information. Unfortunately the forecast for our summit day attempt in two days was not promising; the day before was not forecast to be much better. Today would have been a good day! We leave the camp before the mules but they pass us after 40 minutes. We will next see our bags dumped up at camp 2. The dusty path zig zags up easily. There are lots of people around. Thursdays and Fridays are the weekend in Iran, so we guess that some were taking a long weekend. Here is a very foreshortened view up towards the summit on our way up to camp 2. And here is a shot looking down to camp 1 (on the extreme left of the picture). We have a couple of stops on the way and after around 4 hours we arrive at Bargah Sevom. This was the first permanent camp to be built on Damavand. The original shelter is still there, but a new larger shelter was constructed in the early 1990s above the original one. Terraces have also been created on the hillside to pitch tents. We will be staying in the newer shelter. Here it is. Shortly after taking this picture my camera packs in. In the shelter, even after fiddling around with it for a while I cannot get it to work. The automatic focus has gone and I drain the battery with the attempts to revive the camera. Thank goodness for mobile phones and their cameras. I am not happy, but there you go. Here is the view from the entrance to the shelter. And some more gear being deposited by mules. Then I get in the way of the view. We are shown to our room by the entrance to the building, a dormitory with three sets of double bunks. Being located there it is a bit noisy. And nosey people keep opening the door to see what/who is there! The first task is to have some tea, cake and digestives in the communal dining area. A large group of Poles come in, loud but good natured. We have a brief chat with them. They intend to make a summit attempt on Saturday as they have not been anywhere else to acclimatise. Whilst we are having our tea it starts to snow. It does not last long, but the temperature here is noticeably colder than anywhere else we have been. We then fester until 7pm when our dinner will be ready. A conversation then begins about the possibility of making the summit attempt the following day. None of us seem to be suffering any ill effects from the altitude. But we leave things as they are. The shelter is getting busier so we decide to bag places in the communal dining area at 6.30pm. It is as well that we do because it is packed. People who are camping come in to warm themselves up. Some who have not pre-booked accommodation in the shelter and do not have tents would sleep on the floor here. There is also a small shop where provisions can be purchased. The meal is lamb and rice with a date sauce – there are the stones in it to prove it! It is pretty tasty. As we are eating a man with a pipe starts up. This leads to some dancing and general merriment. Here is a video to show it. A bit of a cultural hit! This lasts 20 minutes or so and the place clears out soon after it finishes. We dwell over orange tea and the remnants of more non-alcoholic beer that we have had with the meal, if only because it is warmer in the communal area. The sun sets and it becomes dark at around 8pm. At about 7.15pm a generator is switched on and provides power for lights and power sockets. Occasionally it cuts out and the place is plunged into darkness so head torches are switched on. But it does mean that I can re-charge my phone when we get back to our room. So that night I go to bed anticipating a 9.30am start for our acclimatisation walk the next day. I sleep solidly for 5 hours until 3am. I am then disturbed by people who are moving around in the building preparing for their summit attempts. So I lie there slightly frustrated that I cannot get back to sleep listening to conversations I cannot understand occurring outside the window. At some point I drift off into a disturbed slumber. Stu is up before 8am and returns to the room to report that the guides are suggesting going for the summit now. The forecast for the next day is now worse. Indeed a big fall of snow with strong winds is likely. I don’t feel best prepared – I should have got up and left at 3am! Indeed the normal departure time is between 5am and 6am. We are told to aim to leave just after 9am. With just fried eggs for breakfast I am stuck with cake and tea. The clients are ready for 9am but the guides are not. It is still chilly at this hour. It is also a beautiful day. In this photo the “cloud” in the centre is in fact steam from fumaroles high up on the mountain. Eventually we get going at 9.30am – very late. Most commentaries tell you that it takes between 5 and 7 hours to climb from the shelter to the summit. And then a further 3 to 4 hours to descend. We set off at a steady pace. Arrvind says he will plod along at the back and will do his best. After an hour or so we have our first proper stop. By now Arrvind is 5 to 10 minutes behind. Majid announces he will stay with Arrvind and Mehti will look after the rest of us. He also says that at 5,000m Mehti will see how things are going and decide whether or not we will continue. Also, there will be no second chance tomorrow if we go above 5,000m but fail to summit. So the pressure is on! As I fiddle around, head down, with my rucksack Mehti and the other four set off. By the time I realise what is happening and have finally sorted myself out they are already 200m ahead of me. I start off again trying both to catch them up but also not to over exert myself. Over exertion can bring on altitude related problems. I never catch them. The terrain under foot is typical of volcanoes. Loose scree is interspersed with ribs of rock on a fairly steep consistent gradient. The scree is not as bad as we had found in South America so it is not always a two steps up, one step down experience. But you do have to be alive to your foot placement. I grit my teeth and for an hour or so I have them in my sights but then they disappear. I do drop Arrvind and Majid after about 20 minutes. I am not alone on the mountain though. I start to overtake a few who are on their way up and then, eventually in greater numbers, pass others on their way down. The broad slopes have a myriad of trails weaving around and over the rocky ribs. I do wonder, if a decision were made to turn around, how on earth this would be communicated to me. I grow a little frustrated and annoyed that they do not wait for me. But on the other hand I meet some people who I might not otherwise have done. Basically I am climbing the mountain by myself. There are few obvious features on this ascent. However, one is a 12m high frozen waterfall at 5,100m. This is fed by a small glacier above, snow and moisture from clouds which freezes on contact. It never flows. As I pass groups I give a hearty “salaam”. My accent is an obvious give away and normally I receive an enquiry as to where I am from. When I provide my reply I am met with a mix of friendliness and slight bewilderment as to why an Englishman is climbing Mount Damavand by himself. As I scramble up one particular rocky rib I pause to regain my breath. Here a German passes me on his way down. His English is poorer than my German but we converse in a fitful manner. He has made it to the top but is tired. His colleagues are ahead of him – I know the feeling! Shortly after then I meet an Iranian guiding a party of eight. He is most concerned about my welfare and wants to know how I am. He asks where my guides are and warns me of the poor weather that is forecast. I assure him I am alright and I know about the forecast. I am tracking my progress on my GPS so if the conditions worsen I can make my way back to the shelter by following the route shown on the GPS. He seems satisfied but I gain the impression he might have tried to persuade me to turn around if my answers had not been satisfactory. Around 5,200m, still 400m below the summit, I start flaking, not because I am tired but because I am losing energy. Although I eat and drink my stops for breathers become more frequent. I am able to measure my progress altitude-wise on my GPS. Progress seems painfully slow. All the traffic now seems to be making its way downhill. Vague sulphurous smells waft in the stiff breeze. On and on I go. It becomes as much a matter of willpower. The sky starts getting cloudier and what I assume to be the summit is covered. But there is still mainly blue sky. I pass a few more people. No-one overtakes me. A few groups are sitting, some people are lying down (possibly asleep). It is impossible to tell whether they are on their way up or down. Ahead I see a young chap. He is moving slowly. Eventually I catch him up. He is Iranian without any English. He offers me some water which I accept because it saves me having to take off my rucksack to get mine. He is trying to tell me something. I work out that he has a headache and that he wants to know if I can help him. As I am carrying Ibroprufen, I can. I give him a tablet plus some nuts. I have a tablet too as a prophylactic and gobble some nuts. At this point we are about 150m below the summit – perhaps up to an hour away. Here is the view up. I leave my new friend behind and start up once more. Within a few minutes I can see Mehti coming down and then the others following on behind. Mehti only recognises me 20 metres away and stops to ask me if I am OK. The others quickly arrive. I have the feeling that they are a little surprised to see me still grinding my way upwards. Mehti offers to accompany me to the summit. The others ask if I want to leave my rucksack with them. I look up at the summit and reckon it will be another 40 minutes. I accept both offers. My young friend comes by and says something to Mehti. Mehti tells me that he has asked to pass on his thanks for providing the Ibruprofen and he is feeling better. Off we go. The nuts that I have scoffed give me a bit of energy. Mehti is a strong climber and keeps stopping to wait for me. We trend leftwards up the open slope. The only feature above now are the rocks on the crater rim. We cross a large patch of snow that is slushy in the afternoon “warmth”. The sulphur smell becomes more persistent but never gagging. Most rocks are stained yellow. Occasionally streams of steam cross our route at ankle height. The rocks steadily come closer. Mehti then turns right and disappears between some rocks. I later find out why. There I am at the summit. I reach it a few minutes before 3pm. Although I have been slower, much slower as it turns out, than the rest of the team I have made the top in 5½ hours which is well within the range of times I have been told to expect. In retrospect I was quite pleased with my performance, especially as I had spent at least 15 minutes with the Iranian lad and perhaps another 10 minutes chatting to the German and the Iranian guide. Mehti is keen for me to start down. But I have not come all this way to be nagged. We take the obligatory photos. An Iranian couple speak to me and give me a biscuit. Perhaps I am looking in need! They then insist on me having a photo taken with them. 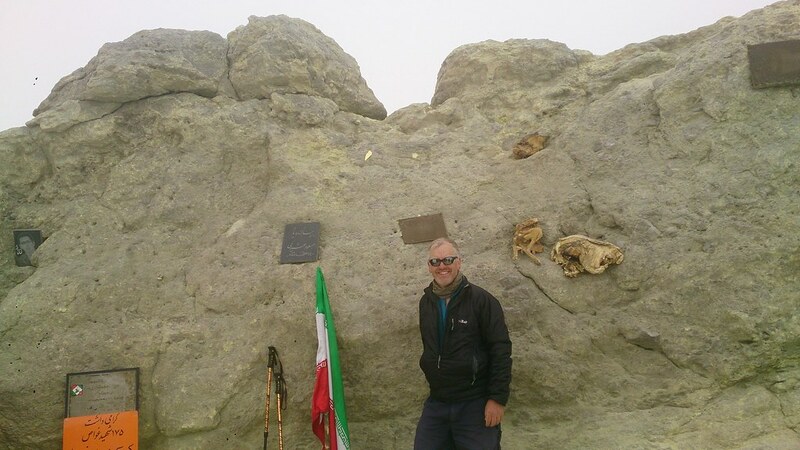 Some plaques are stuck on the rocks as is, bizarrely, a desiccated sheep which you can see to the right of me on the photo before last. There is also an Iranian flag that I am tempted to wave! Next I insist on climbing the highest of the summit rocks which I do. Unfortunately the cloud is down so I have no views, not even into the crater. Through the cloud I can just make out the snow in the shallow crater but not the other side which is only 400m away. I also miss out on seeing the large fumarole which spews out most of the gases just below the summit. Looking later at my GPS track I saw that I spent all of seven or eight minutes in total on the summit. What a long way to go for such a short period and no view! Had we started off at the normal time at sunrise I would have had longer there and a view. Never mind. I later find out that the others have taken just 3¾ hours to reach the summit – I marvelled at their strength. Here are a couple of pictures of them at the summit. In 10 minutes we are back with the others. They have descended a further 100m or so to obtain some shelter from the breeze and the sulphur. They are keen to move off as they have waited about an hour for me and are becoming cold. Here we go. To start with the descent is quick as we slither down earth and loose scree. We take a slightly different way down to take advantage of this. But soon we are back to rock and firmer scree with occasional short scrambly down climbs. I am feeling quite emotional at the achievement. Perhaps it was as well that I was again bringing up the rear. Getting to 5,600m after only 5 days was quite aggressive in terms of acclimatisation. The normal recommendation is to get to 3,500m and then gain 300m a day with a rest day after each 1,000m of gain. I realise that I have not drunk anything for a couple of hours and am becoming quite dehydrated. So I suggest to the others that they carry on whilst I tuck into a Pepsi and look at the views down into the valley. Off to the west is a large lake/reservoir. Ahead of me and to the left is the range of mountains that we could see from the two shelters. I am still higher than them. Mehti waits for me for a while but once I am past the rocky terrain he sets off. I feel as though I have climbed this mountain largely by myself. I also make quite good progress overtaking quite a few people. From a distance the noise of thunder rumbles and threatening clouds appear to the west though I see no lightning. I am keen to get back to the shelter before any storm hits. I am back by 5.30pm – 2 hours 20 minutes down including the Pepsi stop. The others get there 15 minutes before me. Arrvind is also there. He had reached about 5,200m before turning around because Majid said there would not be enough time to summit and return before dark. That is a shame because with a start at sunrise, he may well have made it. He is remarkably stoical about it all. As it happens the storm never comes and the snow is limited to a few flakes around dinner time. Our evening meal consists of pasta, salad and vegetables. As is common in such circumstances, I and a couple of the others do not have much of an appetite despite having expended far more calories during the day than consumed. Indeed, Rob eats barely anything. I concentrate on re-hydrating and only manage half a plateful of food. After dinner I have a long chat with Rob about future objectives. He is off to Mexico in November and hopes to go on to Ojos del Salado after then at the turn of the year. Eventually we are driven indoors due to the cold. We retire to our room where the others are and reflect on the day’s achievements before bed. Tomorrow we descend the rest of the mountain and return to Tehran. 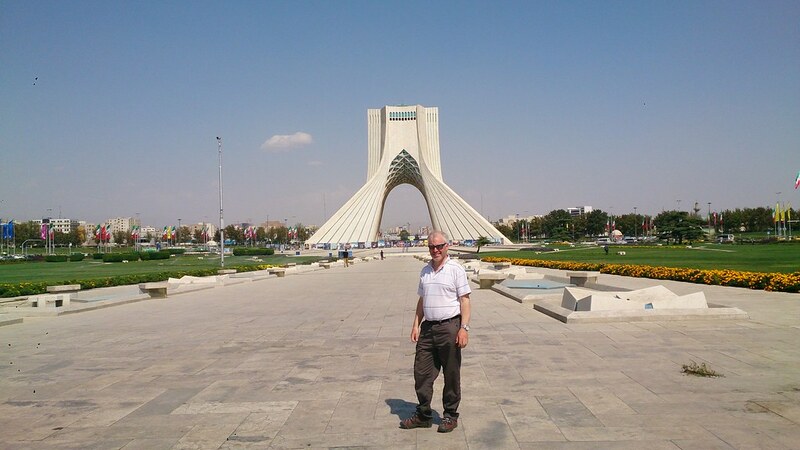 In my next blog (here) I will conclude the story of my trip to Iran.